My previous article, The new way to configure Internet Explorer proxy settings with Group Policy, spoke about how the Internet Explorer Maintenance section of Group Policy has been killed off in favour of ADMX templates and Group Policy Preferences. One benefit of this is that you get rid of the time-consuming “Branding Internet Explorer” section when a user logs on to a PC. I foolishly thought I could use PowerShell to automate this. Simply scan the existing favorites on a machine and pipe them into GPPs. Unfortunately, the functionality to create non-registry GPPs doesn’t exist. The only bit of scripting I found was from the MadProps! Blog. I tweaked it a bit so I could get a CSV file containing the name and the URL of each Favorite in alphabetical order. Name = Whatever you want to show up in the user’s favorites. Target URL = The destination address where you want the Favorite to link to. If you want the favorite to be removed when the policy no longer applies, click the Common tab and tick the 3rd checkbox. This will change the Action to Replace, which means the shortcut gets deleted and recreated each time the policy is applied. 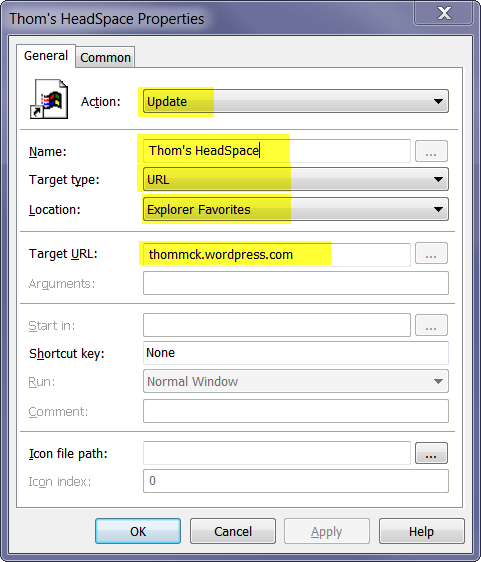 Tip #1: You can use the CSV file from the first bit of this article to copy the Names and URLs for each shortcut. This saves time and avoids typo’s! If I delete a favorite the Group Policy pushed the shortcut back, but it is not sorted alphabetically. I just puts it at the bottom of my list? Any ideas how to sort these from GPP? I don’t think you can automate it to re-alphabatize the favorites list. I just add important favorites that we push out with a . before it. I tell users to right click their favorites and sort by name and then they are all up top. We actually put all of our shortcuts into a subfolder, that way you don’t mix/mess with their personal ones. Any suggestions on how to make IE 10 and 11 Favorites folders (and then populate them) with group policy? I can push Favorites, but I’d love to group them like I could with previous versions. create only adds it if it doesn’t already exist, update will create a non existent file or update an existing one, replace deleted the existing one and creates a new one. Wouldn’t it also be possible to place a folder of favorites on a network share and use GPP to push a registry change to point IE’s favorites to look at the registry share instead of its default location? Any way to position them so a particular link created is always at the front of the list? Script is working fine . We have favorites within the sub folders . Is there a way we can have them exported to CSV format along with the regular one’s ?